The Clergy Project, produced by SOULO Theatre, playing at the Toronto Fringe Festival, tells us religion is theatre. Most familiar with both would probably agree. Both have narrative, thematic importance, and the whole range of human drama and emotion. Because truth can be stranger and more compelling than fiction, having a range of religious leaders tell us stories from their life’s work is rife with dramatic possibility. 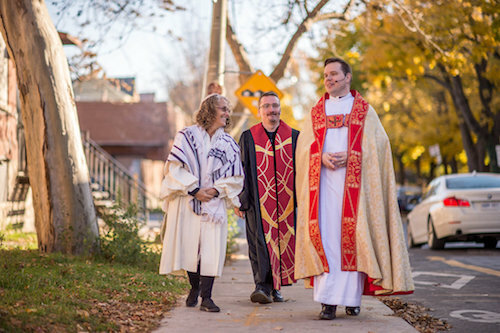 The project’s three clergy, Reform Rabbi Elyse Goldstein, Unitarian Reverend Shawn Newton, and Anglican Father Daniel Brereton, all trailblazers in their own right, share what calls them to the pulpit. As a very lapsed Jew, I wasn’t expecting this show to strike a major chord with me, let alone wreck me emotionally. Call me a convert, because it did. At the start of the show, held in the tiny but beautiful historic Narayever Synagogue, the clergy make a dramatic ceremonial entrance in their robes. Reaching the minimally-appointed stage (three music stands for scripts that are rarely referred to), they literally cast off their vestments to reveal humourous personalized t-shirts more fitting to a sports team. This informality carries over to the rest of the show, as liturgy is ditched for humanity, secular music (such as “Like A Prayer” and “Take Me To Church”) is played, swear words (rarely) fly, and they playfully banter and mock the stereotypes associated with each religion. Each relates his or her struggle for acceptance in their respective communities, whether it be due to gender, sexuality, or even a questioned belief in God. When I was 13 and told my weekend Hebrew school class I thought I wanted to be a rabbi, it was a quick phase. Not so for Rabbi Goldstein, who became one of Canada’s first female rabbis after an epiphany at her Bat Mitzvah that shocked the congregation. Goldstein’s moving story of her difficult road to a title not traditionally held by women is one of the major highlights in a show filled with them, many of which garner spontaneous applause. Goldstein is fantastic; passionate, fiery, and in total control of her story. This is not to discount the excellent performances of Newton or Brereton, who both had to deal with a religion that didn’t fully accept their sexuality. All three ably balance the heartache and joy they have found in their spiritual communities. The most moving section involves the religious leaders’ most important but least favourite job: dealing with impending death, particularly those difficult types of death they don’t teach you about in seminary. Painful and brave, each is a stunning story of compassion and mercy over rules, and I had to stifle my embarrassing sobs. The stories play off each other, interweaving and connecting, even though they are mostly presented concurrently. I was in tears one moment and laughing the next at stories such as that of a disastrous Christmas pageant. It should be obvious, but it’s still refreshing to hear that sometimes religious leaders don’t know what the hell is going on, either. One of the delights of the performance I attended were the two ASL interpreters who switched off to cover the performance. The minimal staging meant it was a great deal of fun to watch the movement and personality of the interpreters while listening to the stories. As well, if you have any burning questions for the clergy, the show ends with a ten-minute talkback. My one wish would be for a little more diversity of religion, experience, and views (I have heard that there was originally a Muslim leader attached to the project, whose voice would have been valuable). There is diversity here, but everyone is that very specific type of clergy who would do a Fringe show, so we get quite a rosy view of the modern religious world. A little of the banter felt overly stagey, and some of the humour is the type that can only seem funny in church. But that doesn’t detract from the powerful argument the play makes about the value of creating spiritual community, and it certainly doesn’t detract from the raw emotional magic that happens between the bimah and the pews. If these honest, heartfelt stories were the type of sermons preached every week, maybe I’d go back to shul. With Rabbi Goldstein, what you see is what you get every week at City Shul. Come check us out!